Geronimo Stilton is the editor of The Rodent’s Gazette newspaper in New Mouse City. He and his family must embark on a swashbuckling, time-traveling adventure to stop his dreaded enemies, the Pirate Cats, who have gone back in time to stop Christopher Columbus from sailing west and discovering new land. Filled with mystery, danger, adventure, history and facts, Geronimo et al. take the elementary reader on a trip across the seas and help us discover our own history. We meet Ferdinand and Isabella, see old sailing folklore up close, discover native populations, and learn a bit about life in the 1400s as the team stop the greedy cats. GERONIMO STILTON is a hoot for those who love animals and adventure. The pace moves smoothly, the text is robust but not overwhelming, and the art is kid friendly and fun. What’s not to like? 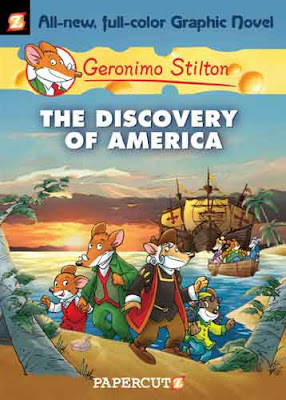 The way that the GERONIMO STILTON graphic novels incorporate real-life historical events and persons creates a real opportunity for teachers to use dual texts in lessons. It would be very easy to study Columbus’ trip with a nonfiction book and combine it with the fictional comic book to help students understand more than just … “In 1492 Columbus sailed the ocean blue.” They can learn about why Geronimo and his clan had to change clothes, roles of sailors on a ship, how folklore can influence people, and the importance of different cultures. GERONIMO STILTON is originally an Italian traditional children’s book series translated into English and published in America by Scholastic. Papercutz is publishing all new GS stories in comics format. Flying on the coat tails of the popularity of the traditional book series, and the fact that these are new stories (not old GS stories repacked in comic form) I think classroom teachers have a real winner available to them and their students. Thanks for the review. Papercutz has done a great job with these books. The size and hardcover binding of the volumes are wonderful for classroom and library collections. You can see they will last for years of enthusiastic use. Integrating facts into the story is what Geronimo books do best and I'm glad they carried on this facet to the GNs. Thanks for your great website too Chris! Thanks for the kind words, Inger. We love what we do believe in the power of comic literature.